This is good, that’s not good. This is bad/evil, that’s not bad/evil. Good how? Bad/evil how? Depending on the contextual reality surrounding an action there are ways to determine how to categorize it. For example, the killing of another may be in self-defense against their aggression, or as an act of murder to take the life of someone that wasn’t harming another. These are both absolute categorizations that can be determined, yet they are *relative to each other. Some of the confusion with good and evil is that people think its “absolute”, “pure” or “infinite” in its application for being capable of understanding such ideas and ideals to live by. Some people think you’re either “good” or “evil”, in some “absolute” capacity, while others reject such a fallacy and throw out everything in an ignorance and denial of understanding what is good or evil, and claim “there is no good or evil/ right or wrong”. Both types of thinking are wrong and further the confusion. Something is more good relative to something else that is less good. Something is more bad relative to something else that is less bad. This places everything on a scale, continuum or spectrum for categorization. There is a great deal of variability, multiplicity and diversity to our actions and behavior. 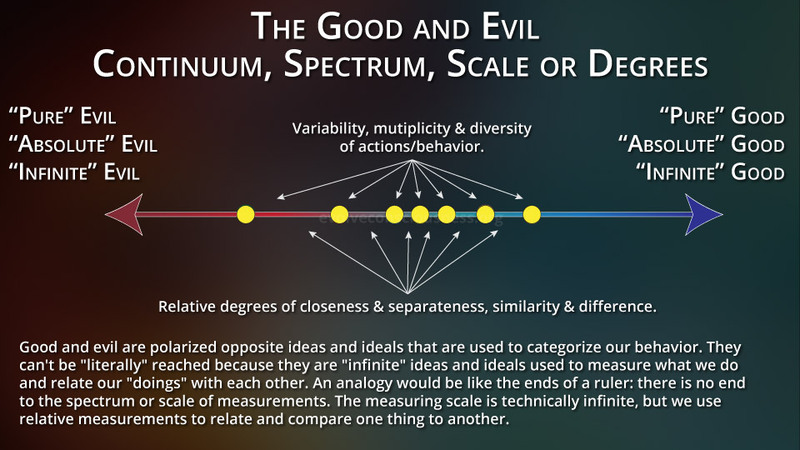 Good and evil can be conceptualized as being part of one spectrum, where going more towards one side, means less of another. If you don’t murder, that’s good, but if you do steal, that’s bad. People aren’t purely good or evil. The actions they engage in, the behavior they express, is good or evil in varying degrees of strength towards one polarity or the other. Each polarity is an idea, as an ideal — “absolute”, “pure” and “infinite” — that actions can be relatively positioned in a continuum, spectrum, scale or degrees to understand their relationship to each other. Is There a ‘Literal’ Good and Evil? Good and evil are polarized opposite ideas and ideals that are used to categorize our behavior. They can’t be “literally” reached because they are “infinite” ideas and ideals used to measure what we do and relate our “doings” with each other. An analogy would be like the ends of a ruler: there is no end to the spectrum or scale of measurements. The measuring scale is technically infinite, but we use relative measurements to relate and compare one thing to another. The words we use are symbolic constructs to help us understand reality more by defining what happens in reality. Good and evil are used for that purpose in terms of the type of actions we engage in that have consequences for others. The same is so for moral and immoral, or right and wrong. There is no literal “good or evil” existing as something in itself, just as there is no literal “action” that exists as something in itself, or literal “emotion” that exists. These are all references for what we do and create. Emotions reference and correspond to electro-chemical physiological processing that we feel. Actions reference and correspond to the power of our hands, feet, bodies or voice to affect or create change. Good and evil reference and correspond to the type of actions we create. Actions are a general categorization, while specific behavior can be further defined in terms of right-action and wrong-action, moral and immoral, or good and evil. Actions, experiences, conceptions, etc. never reach the polar opposite ends. The variability, multiplicity and diversity of expression falls between the poles. “Everything is relative” (i.e. has a relation) to other things on the scale in varying degrees of similarity and difference in progression towards one end or the other. Therefore, comparison is a necessary tool throughout life. This doesn’t mean there is no objective morality to comprehend and attribute towards actions by engaging in some form of false moral comprehension as “moral relativism” or “subjective morality”. Good and evil can’t be dismissed through the attempted negation of discernment by clumping everything together as if “there is no good or evil”, or “that’s dualistic and negative thinking”, or “it’s all part of one thing” that doesn’t accurately reflect reality and the ability to discern actions as being more right or wrong than others, or more good than evil, etc. I’m explaining how the words good and evil exist as symbols to reference reality. Good and evil are part of reality as long as we have actions and can conceptualize abstract definition such as we do. Just as much as love and fear are a part of reality that we can categorize for our emotional changes. Each are part of a complementary dualistic framework. Duality isn’t bad, duality is part of existence and life. Thinking duality is bad is what’s bad. Denying duality prevents a more accurate perceptions of reality as it is. In varying degrees of relativity, there are things that fall into a neutral ground if we want to get even more specific to understand the varying levels of actions. We can see the position of something as being relatively neutral, more good than bad, or more bad than good. But that will have to be for another post. Thoughts and emotions are our tools and guides to determine the objective differences between what exists and make choices in life. For the existence of morality, it is our actions and behaviors that are created and being described. Actions we (and others) engage in can be the same actions in the same context, or different in varying degrees. The various degrees of closeness and separateness (or similarity and difference) between properties or characteristics allows for analysis, diagnosis, evaluation, assessment, discernment, distinction, correspondence, correlation, comparison, association, identification, and judgment. Judgment is also part of life, not some “bad” thing either. Our ability to discern actions accurately can vary as well. We have many biases to be aware of, and emotions that can steer us away from an objective appraisal of our own or other’s actions. We can often feel a wrong-doing in our bodies and know it in our minds. We can also be wrong and misled, duped, hoodwinked, bamboozled, conned, tricked, fooled, manipulated and deceived into false modalities of expressing consciousness — our thoughts, emotions, actions. 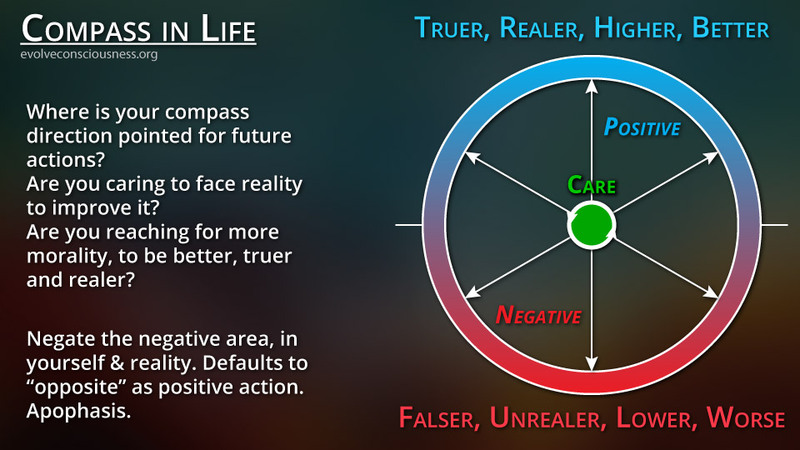 With our tools in consciousness developed and used properly, we have a compass in life that can guide our actions and behavior by being able to objectively recognize what our behavior is doing in reality. Cause and effect is beautiful to understand how we can apply objective understanding to things. Using and continually developing these tools, we can make choices and decisions that result in actions, behaviors and habits that we recognize to be better, more-accurate, more-correct, more-right, more-good, more-true and more-moral than others. In no way does this give credence, merit, or validation to the fallacy of false moral understanding like “subjective morality ” or “moral relativism”, i.e. “there is no good or evil” or “there in no right or wrong”, etc. I have seen all of the above employed in people who ascribe to the identity and beliefs of being a “New Ager”. “Don’t compare”, “don’t judge”, “thinking is flawed”, “follow your feelings not thinking”, “logic is flawed, follow feelings”, “duality is bad”. I have literally heard this before from confused consciousnesses. Dismissing, denying or ignoring a comprehension of good and evil is an effective method to validate, justify, excuse, defend and “feel-good” about ourselves and our current choices, decisions, actions, behaviors and habits. Then we don’t have to change. People can then be content to not discern reality for what it is and do something about it. There is nothing to do, right? It’s all just “whatever” with nothing right or wrong and everyone can just believe in whatever self-deluded fantasy they want in order to remain attached to how “good” they think they are and not need to change anything. If our lives and the world is to change to a better, more-accurate, more-correct, more-moral and more-right way to live, we need to stop denying the validity of categorizing actions and behaviors. We need to instead actually learn how to discern the difference between truth and falsity, right and wrong, moral and immoral, and good and evil. Then we can know what is right to do and what is better to do, by actually understanding what is wrong to do and what is worse to do. We need to unbecome, unlearn, and learn what not to be; then being and becoming more good, more right and more moral flows as part of not doing the opposite.